ONE DAY ONLY!! TUESDAY, SEPTEMBER 4th 2012!! 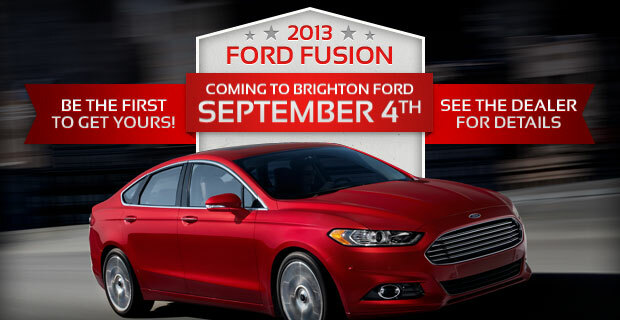 BRIGHTON, Mich.,- Stop by Brighton Ford on Tuesday, September 4th for a sneak-peek experience of the All-New 2013 Ford Fusion! Check out the slick new redesigned exterior and all of the added and upgraded features that the 2013 Ford Fusion has to offer before it officially hits our lots later this year! Get your 2013 Ford Fusion Brochure to learn more about the completely redesigned Fusion. Brighton Ford also proudly offers Ford Fusion Rebates and Ford Fusion A Plan Pricing to save you money. Stop by your Ford Dealership Serving Metro Detroit to learn more and get your hands on the 2013 Ford Fusion during this one day only preview! Brighton Ford is located at 8240 Grand River Ave. just north of I-96 in Brighton. We are a family owned and operated business that strives on customer satisfaction. For more information on Brighton Ford visit BrightonFord.com or give us a call at (800)-836-8206.